Mice are nocturnal creatures, and, therefore, are rarely seen by the homeowner. The most obvious indicators of their presence are droppings (1/8 – 1/2-inches long, dark and pointed at both ends), sounds of them running, gnawing or squeaking, or damage to stored food or materials used for nesting. Compared to rats, mice forage only short distances from their nest — usually not more than 10-25 feet. When food and shelter are adequate, their foraging range may be only a few feet. For this reason, traps and other control devices must be placed in areas where mouse activity is most apparent. Mice prefer to travel adjacent to walls and other edges– another critical point to remember when positioning control devices. Mice are very inquisitive and will investigate each new object placed in their foraging territory. If control devices are not initially successful, move them around to a different location. Mice feed on a wide variety of foods but prefer seeds and cereal grains. They also are fond of foods high in fat and protein such as nuts, bacon, butter and sweets (an important point to remember when choosing a bait for snap traps). 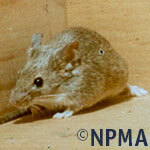 Mice are “nibblers” and may make 20-30 visits to different food sites each night. To control mice, you must “think like a mouse,” keeping in mind the behavioral traits noted above. The best way to control mice is to prevent their entry. Mice are able to squeeze through extremely small openings narrower than the diameter of a dime. Cracks in the foundation 1/4 inch and larger should be sealed, as should gaps and openings under doors and where utility pipes enter the structure. Good sanitation and food storage practices are helpful in reducing problems with house mice. Since seeds are a preferred food, all adjacent to the building should likewise be eliminated. However, because mice are able to occupy such small nesting areas and survive on minute amounts of food, sanitation alone will not normally eliminate an existing infestation.